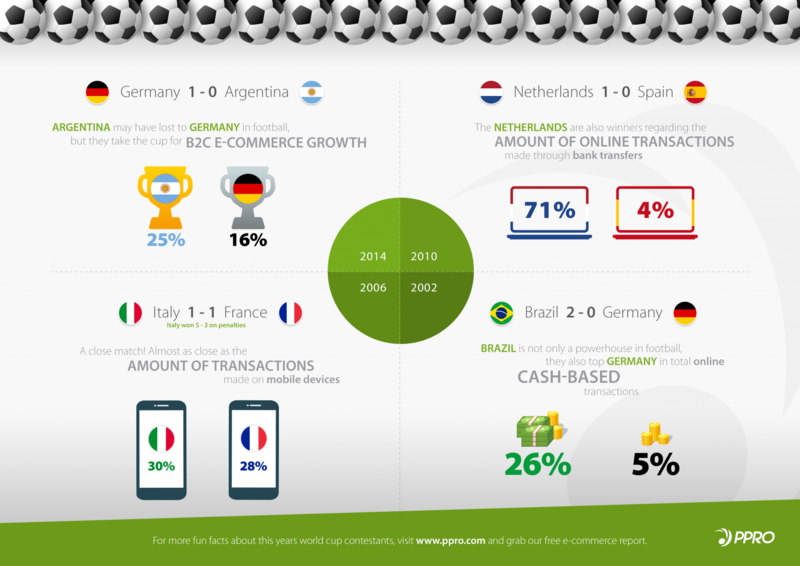 Infographic: World Cup e-commerce – who will be victorious? It’s finally time – today (14 June), the opening match of the FIFA World Cup 2018 will kick off. Sports fans are likely to stream more than 15 million hours of digital content, write 700 million tweets and post more than three billion World Cup Facebook posts over the four-week period, providing immense e-commerce potential. According to PPRO Group, during the last World Cup, traders spent $1.5 billion on thematic advertising and marketing. In 2018, a worldwide increase in the e-commerce market of 14% compared to the previous year has been predicted. Online spending increases “massively” every year and significant occasions such as the World Cup provide “great opportunity” for merchants to capitalise on. For example, in the UK, 77% of UK consumers shopped online in 2017, up from 53% in 2008, with an average spend of £3,003. This is expected to increase by 14.6% this year. With this in mind, PPRO Group has created a handy (and footy) infographic which shows how e-commerce nations square off.